1 : Sweep your hair off to that side, just slightly off center. 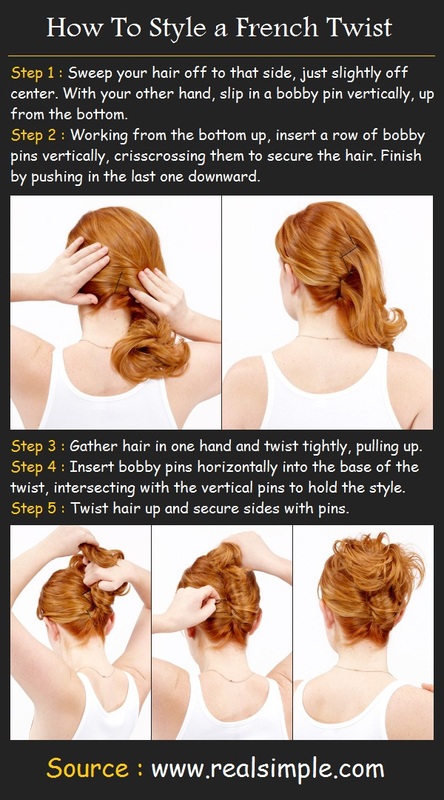 With your other hand, slip in a bobby pin vertically, up from the bottom. 2 : Working from the bottom up, insert a row of bobby pins vertically, crisscrossing them to secure the hair. Finish by pushing in the last one downward. 3 : Gather hair in one hand and twist tightly, pulling up. 4 : Insert bobby pins horizontally into the base of the twist, intersecting with the vertical pins to hold the style. 5 : Twist hair up and secure sides with pins.